It's the close of the pantomime season and this can only mean one thing. Whilst the rest of the actors disband to their familiar pastures of local radio and BBC 1's Doctors (when was there last a pantomime poster in the UK not featuring the words "... from BBC 1's Doctors"? ), pantomime cows disappear entirely from view. Make the most of them this week, folks: you won't see another one until December rolls around again. For generations, the normally high standards of scientific inquiry have been unusually content to just accept this state of affairs. It's baffling really, considering the investment in terms of money, time and intellect that the British nation are capable of - just look at their input at CERN, for instance - that no-one has ever really tried to study where the pantomime cows all go between January and December. A lot of people will tell you that they are not real cows. I say, let's not make any definitive statements until we know things for certain. Facts - DATA - is what we need, not hokey old conventional wisdom. So it was at this point I decided to catch a pantomime cow. Here's my plan. As with all good science, you have to have a hypothesis. 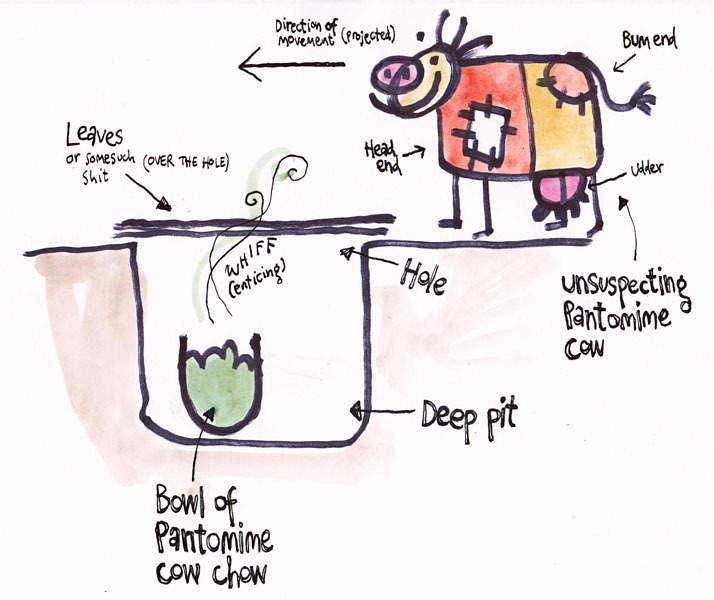 My hypothesis is that the pantomime cow is a migratory species. Britain in the months of February to November is, on average, too warm an environment for it. So, my belief is that they majestically sweep northwards once the pantomime season is finished, most likely at night as to my knowledge this great migration has never been witnessed. 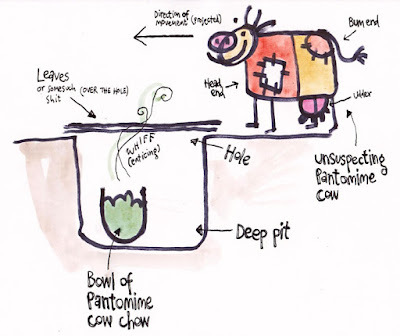 Of course, in order to test my hypothesis, I need a pantomime cow, which I intend to capture according to the above in-depth scientific diagram. A basic tiger trap should prove sufficient, although the pit required does need to be large enough to contain a pantomime cow: an animal that is, on average, the size of two adult men. To tempt the cow I'm using food as bait. Again, no-one is exactly sure what a pantomime cow eats - cynics will tell you that it's green room Pringles - so a small amount of trial and error is going to be required. Capturing my pantomime cow could well take some years and a bit of luck, but it's time I'm willing to invest. Once I have a pantomime cow I plan to electronically tag it so as its migratory patterns may be precisely tracked and traced and we can finally know for certain where the pantomime cow summers. There is a chance that after years of digging holes, testing different food combinations and countless court appearances that my budget won't extend to electronic tagging equipment, in which case I plan to put a small hole in a pot of paint and hang it off the pantomime cow's udder, creating a trail I can then follow.